Off to the WA coast for a few days to really get away from it all. No phone, TV, or Internet. Even the cell phone doesn't work. 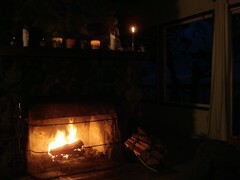 Just the fire, the ocean, and silence. Hoping to focus my passions for the New Year. Have a good one, everybody!